Book condition: Very near fine in a like dustjacket. New York:: Newsweek Books,, (1979). Very near fine in a like dustjacket.. First printing. 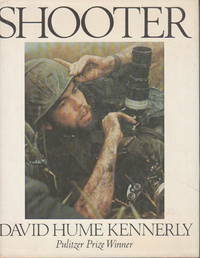 Autobiography of David Hume Kennerly, a photo-journalist/photographer who became UPI's bureau chief in Saigon at just 24, and was awarded the Pulitzer Prize at age 25 for photographs that "capture the loneliness and desolation of war" and who then became "Personal Photographer to the President" during Gerald Ford's presidency. INSCRIBED on the verso of the front endpaper and dated in 1990. Illustrated with 50 black and white photographs. 261 pp plus index.